We have videos of events that we've organized or participated in. Our videos are shot in a rough, morale boosting, documentary style, showing traditional TIME'S UP! action at its best. Though based in New York City, we participate in (and make videos of) actions and campaigns all over the globe. Our videos can be found on YouTube and Vimeo. Time's Up Needs A Space! Yes Network's profile of Time's Up! Time's Up's tribute dance ride to the King of Pop. The Annual Pies of March Bike Ride in 2008. NYC's Summer Streets 2009 frees the streets for pedestrians and cyclists . Dogs and bicycles on parade! Hands across Union Square save the Pavilion on 6/5/2008. Naked Bike Ride Takes on Big Oil. Getting out the message to save Union Square. Police raiding bicycles on 6th Street. 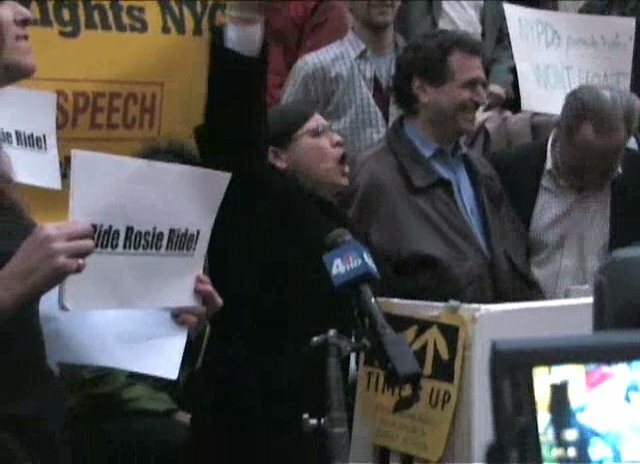 A documentary about the March 2007 Critical Mass ride. A video of NYPD seizing locked bicycles. The rising sea levels of the future send these polar bears on a hunt for ice cream in New York. 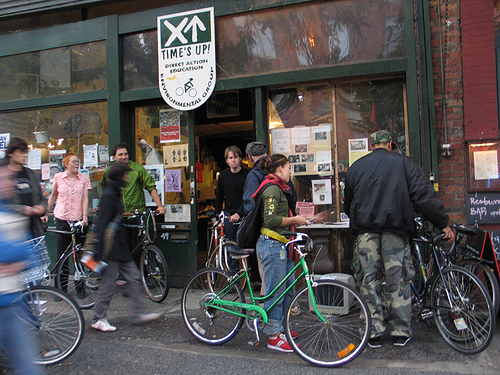 A German TV feature on Times Up! Time's Up! helps plant gardens where there once was garbage, only to have them torn out. A video of efforts to save the community gardens. Polar bears run amok in Union Square! Also, an interview with Barbara. Bill is interviewed for Day of Climate Action. The Time's Up! bicycle clowns hitting the streets in 2009. A video of NYC's 2008 Summer Streets event. A day with the Bike Lane Liberation Clown Front of Time's Up! A video from a 2008 Critical Mass in which a NYPD officer is caught checking a bicyclist clean off of his bike. Time's Up's Roving Garden Party, organized with the Rude Mechanical Orchestra to raise awareness of past struggles to conserve community space in New York City. The YES Network's profile of Time's Up! TIME'S UP! 's annual celebration of small-wheeled and folding bikes, this Saturday, starts with a race in Central Park and is followed by a folding bike ride and festival. Both the ride and festival are open to the folding curious as well as people who already own folding bikes. A documentary about the March 2007 NYC Critical Mass. Shot with more than 30 cameras the film follows the first critical mass bike flash mob held under the new NYC parade permit rules that prohibits citizens from assembling in groups of more than 50 people without getting previous authorizion from the police department.Click one of the following links to play the video in a popup window in a format supported on your computer. Right-click to "Save As." Our newest and best-edited video. This video was originally made for BikeSummer 2002 in Portland, Oregon. It is an excellent portrayal of TIME'S UP! 's campaigns in NYC, with New York's own style of high energy performance. Reverend Billy, Radical Rockets, Hungry March Band and the Radical Cheerleaders. (MP4 format, 1.2 MB)or right click, "Save As ..." to download. The bright sunny morning of April 21 welcomed tens of thousands of protestors to the city of Quebec. Protesters once again lay siege to the Free Trade of the Americas Conference. Drums signaling the continuing struggle of efforts to breach fences both literal and metaphoric. Chants, cheers and songs make this video very uplifting.Click image for video clip (MP4 format, 3.1 MB)or right click, "Save As ..." to download. 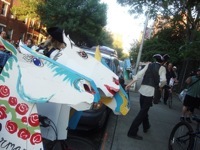 Featuring the RTS sharks, special Critical Mass, detaining govt buses. Click image for video clip (MP4 format, 2.5 MB)or right click, "Save As ..." to download. Sept 26, 2000 from the front lines of the struggle against globalization. The video shows the many colors the protesters broke up into, to surround the Kongresove Center, where the meeting was being held. Everything from the peaceful cheers of the radical cheerleaders to the fence beratement of the pink and silver team and the all day rock-throwing of the Black Bloc. The battles continue into nightfall on the Vaclavske Namnespi Square. Click image for video clip (MP4 format, 2.2 MB)or right click, "Save As .." to download. Click image for video clip (MP4 format, 8.5 MB)or right click, "Save As ..." to download. Click image for video clip (MP4 format, 1.6 MB) or right click, "Save As ..." to download. Click Here for video clip (Quicktime format, 204K). Special thanks to Raven Rock Media for all the help with the video.